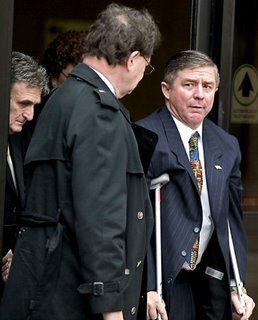 Philadelphia City Councilman Rick Mariano is sentenced to 6 1/2 years in federal prison for being stupid. Well, that's not technically the charge. He was found guilty of soliciting about $25,000 in bribes from businessmen in his district. He used most of it to pay off credit card debts. Some of it he used to pay for membership at his health club. In collecting the bribes, Mariano left a paper trail that was practically a super highway. It was so wide and deep the feds had no trouble following it. Even though he had nearly a year between the time word of the investigation leaked and when the feds raided his office, Mariano never made an attempt to repay the "loans," as he alleged they were. After the raid, Mariano went around telling aides, in so many words, I am guilty as hell. I did it. I took the money. Those aides later testified for the prosecution at the trial. Finally, days before he was indicted, Mariano took to City Hall Tower and had to be talked down by Mayor Street (backed by a contigent of police). The fear was that he would commit suicide. But, maybe the dumbest thing Mariano did was to throw away a political career and a job that paid $102,000 a year with a panoply of benefits and perks. Why? For credit card debts. For membership in the Sporting Club. For peanuts. Mariano was lucky, in a way. The prosecutors wanted him sent away for 10 years. Still, he wept in court at the sentencing hearing -- and begged the judge to let him do community service here or in Iraq. The judge nixed the Iraq part. He picked the here part. And he made it jail. Mariano actually volunteered to do community service in Iraq? I'd've taken him up on that offer. Yeah he said something along the lines of wanting to go to Iraq to teach them about proper government. Mariano was my councilman. I don't think he's a bad person, just dumb, as Tom said. I think in this case Mariano got into debt over his head and picked the wrong way to get out of it. I don't think there was much corrupt intent at all. In the end, mostly what I feel is very sorry for the guy. He wasn't my councilman, but I'm inclined to agree with phillydem here. Even the amounts of money involved were small, and Ron White did a lot more damage while he was alive. Very sad case. It kills me that we show such sympathy for these guys. I mean, local politicians in Philadelphia are like war lords in under-developed countries. They do enough to stay in power but not enough to make a lasting difference. They assume the disposition that people owe them something instead of being public servants that owe the public. In short, I'm appalled that he only got 6 1/2 years. It's pathetic that he begged for leniency, in whatever form. Being a nice guy doesn't indemnify you from anything. We need the Feds to get in this City and build cases against a dozen others if Philadelphia is going to achieve any level of respectability.